In Part One of this small series on author branding I discussed my Concerns in Author Branding (specifically to genre). In this second part, I will discuss how to potentially brand without genre. But first, I had to go back and remind myself of what author branding is. I include several post links, discussing the subject, and several examples as I continue to explore author branding. In Aug 2012, MuseInks writer, Ami Hendrickson wrote a post ‘The Genre-Free Writer: Looking for the Common Thread’. I stumbled on this post as I was doing a little exploring yesterday for a writing project management workshop I’m on. It was pure kismet that I found the post, and it kicked off some ideas in my mind. In her post, Ami admits that she’s always known her writing didn’t fit into a particular genre. I believe that it’s a thought shared by a lot of writers – and newer writers like me also take quite some time to sink into one particular genre. When I first started moving into my own writing dream, I wrote urban fantasy. I’m not actually sure why I jumped into the thriller / crime / mystery genre other than those genres are what I enjoy reading and watching more (at the moment), and I really had one story that needed telling. But obviously fantasy is something close to my heart, and part of my own writing origins story. What elements connect all of my characters? What common threads run through all of my work? What plots and themes most move me? What one trait is vitally important to my characters? Her own answer to these questions, shared on the post, involved “quirky, unselfish characters with hidden strengths” amongst others. Her responses to those questions also entirely answered what her ideal readers would like. We all know that we should be writing to that one ideal reader – Rachelle Gardner’s ‘Stop trying to brand yourself’ (See Part 1 of this series) article also pinpoints this. Except, analysing that ideal reader is sometimes a huge mission, particularly within a popular genre which has many sub-genres. And what about cross-genres? Ami’s post did a huge amount for my thinking, something already started off as I re-designed my writing blog, and began plans to write back in my fantasy domain. Elizabeth Barone thought similarly in post on Indie Author Branding: How to Figure Out How to Brand Yourself (March 2013) where she discusses an interview Joanna Penn did with CJ Lyons where author CJ Lyons talks about her own brand tagline: “thrillers with heart.” (Incidentally, Joanna Penn and CJ Lyon’s Prowriter courses on similar topics are well worth the money, in my opinion). You can’t really brand yourself as “the horror guy,” because Poe tops that list and Stephen King has a lock on that broad category for the foreseeable future. You might, however, be able to lock in a brand as the noir-horror guy or rampant technology horror guy. Narrowing down gives you a specific hook that readers can grab. Take a look at the things you’ve written. Look for recurring themes, character archetypes, settings, or particular quirks you like to use. villains that have good points? villains that are not human? domestic or smaller conflict, or world-sized problems? Create a few phrases, or word-choices around your niche. Play with words, write them down, draw them out, mindmap or brainstorm them. Put it to bed and test it. Does it sound catchy the next morning? A week later? After a month? Don’t be afraid to tweak it. Use it across your platform. So, I had some means to come up with a possible non-genre specific brand. But could I pull it off? Was my understanding of brand all that sharp in the first place? I had to go back and consider what a brand actually is – how it’s displayed, what it means. 1. What’s in a Brand? Rachelle Gardner asserts that an author brand is simply two things – the author name, and genre. There are several other posts out there, high on google hits, explaining how to find your author brand. Read the post, and you will find how some of these elements fit into the same questions Ami Hendrikson asked herself to find the threads in her fiction. And of course, the Creation story – the story of our origins in writing – is one that all of us as writers (including famous published authors) like to share – just when and where were we in life when we decided we were destined to be a writer? The sacred words element explained in Martin’s post, is another one well worth exploring. Similarly, Lynn Viehl, of Paperback Writer fame, explores words for branding in an August 2012 post, ‘Wordsmithing [Your Author Brand]’. Based on Margaret Wolfson’s article on branding in an issue of Poets & Writers, the post says that brand name styles can be grouped (broadly) into several categories. These can be used for branding particular fiction brands or writer brands. Ie. Harry Potter is a brand for JK Rowling, based obviously on the main character name. Incidentally, Lynn Viehl is a good example of an author who has published in multiple genres and categories – science fiction, romance, dark fantasy, young adult, christian fiction, and non-fiction (including many free ebooks on writing craft). She’s done this via various methods including writing under different pen names, but provides one branding website under the Paperback Writer domain. This site is a free blogger blog, and Viehl doesn’t provide any branding designs like logos or colour-schemes to differentiate her brand – it’s solely on the name. The importance of words – or keywords, is also discussed in Joanna Penn’s ‘How to Discover and Build Your Author Brand’ and Matthew Turner’s ‘Creating an Author Brand to Boost Your Platform’ (discussed below), as regards SEO, or methods for your readers to find you. Of course, it’s much easier to brand the fiction, than the actual writer, with a few choice words. So what’s in a personal brand, in comparison to a fiction brand / series brand / genre brand? “A brand is more like a flavor, a style, an expectation of you and your work, based on what you choose to write about but also on how you present yourself – your name, favorite images of you, your bio, your hobbies and passions and what they say about you as a literary personage” ~ Philip Martin, ‘Build Your Writer’s Brand’. ‘Discover and Build Your Author Brand’ (Feb 2013) Kimberly Grabas. “Simply put, your brand is your promise to your audience.” The post goes more into building platform than how to find a brand persona. ‘IndieReCon – Building an Author Brand by Ali Cross’ (Feb 2013) Ali Cross. Definition of brand:“A kind or variety of something distinguished by some distinctive characteristic.” Ali’s IndieReCon class concentrated more on the ‘look and feel’ of some brands – the platform design and social media usage – than how to create or find one. Ali Cross is another interesting example of author branding. In the IndieReCon class above, she also discusses her own brand – the Ninja Writer icons, Writer’s Dojo community etc, that she is better known for in the writing world, rather than discussing her Young Adult reader base for her fiction. Ali uses her name as branding, but the logos and content are more towards her writing community work. Her Ali Cross site (built on a free blogger blog), links across to the books website. Ali’s book branding website is themed on the setting for the fiction – ‘Desolation’. The website (again, built on the free blogger platform) shows very different branding than that of her Writing Dojo and personal brand, although both link through to each other. The example also shows you that you don’t necessarily need to invest money in building a website from scratch – Ali has used her money on securing the domain names but is happy to use the provided templates and services through free blogging platforms. ‘Creating an Author Brand to Boost Your Platform’ (June 2012) Matthew Turner, guest posting on Joel Friedlander’s Book Designer site. This post discussed ‘Brand Identity’ – fonts, colours and other elements that mean people who visit your website, will know it’s you; of “combining your brand identity and your book into one coordinated package.” In this post, Turner also nominates Joanna Penn’s fiction website as displaying a similar design / brand to that of her fiction book covers. Note: I initially thought this post took me back to having issues with different genres. After all, a YA superhero book cover (if the concept ever reaches life) will look very different from my darker edgier adult thriller fiction. How could I possibly combine a more generic personal brand into different genres of book cover designs? The answer? A key component in all of this is the author name. If I didn’t want to change and introduce different pen names for each genre, then I could concentrate on providing a consistency in how the author name is designed on each cover, no matter the genre. For indie authors, in charge of all their design elements, this is more easily done than perhaps somebody approaching traditional publishing. “Keep in mind, building an author brand is not the same as building a platform. A platform connects you to people and tells them who you are. It’s a personal effort that enables you to influence how people perceive you and your work. A brand is a marketing tool. It’s an umbrella that ties your work together and suggests to readers what to expect – it doesn’t replace a platform and without a platform, won’t do you that much good”. 3. How Do You Build Authority in your Author Brand? The Brand tag image I used above came from an online magazine site called Speaker Magazine which is about – gasp – speaking. But the image came specifically from an article entitled “Author Authority– How to Brand Books and Speeches” written by Dan Poynter. When an author is new and unknown, his or her name is placed under the title. As authors become known, their names rise to the top of the cover. Of course, Indie writers starting off, can choose to stick our names up right above that title from the start (and coincidentally, without being aware of the psychology behind this, I re-designed my own mock book covers a year back to do just this). But Indie readers are aware of that. Never-the-less, it’s one powerful design element which offers some use. Poynter points out that speakers wanting to use this, can capitalize on credibility by putting their names at the top of slide presentations etc. For the sake of self-fulfillment hopes, stick your name up at the top of book covers – and your website – whenever you have the chance. It’s all about your name. Funny that. It’s easier for me to see big brands like Pepsi, Nike or IBM, and understand the branding / marketing elements. It’s something we are all aware of, and see day-to-day. But when it comes to Authors, the differentiation between brand/marketing and communication/platform is still quite difficult to grasp. 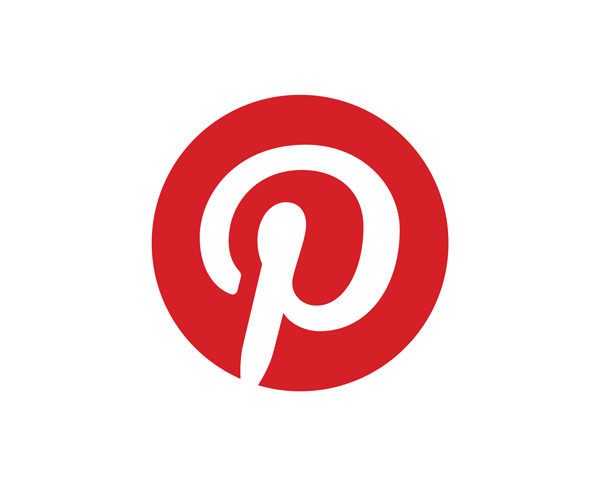 Many of the posts I listed above, although titled on Author Brand, actually start discussing logos, websites, and social media – what I immediately think of as “a platform” or the method to communicate. I understand the struggle – authors and writers deal in words. How we communicate is – words. Websites are words, social media are words. The things that allow us to put our commodity of words across to people are platforms for our words. Of course, platform is bigger than just the places (on and off-line) where we sit ourselves with our words. It’s about fans, readership, and reach. It packages it all up. How a reader knows they have arrived, is via our (hopefully quantifiable) brand across that author platform. ‘Platform is more about putting in consistent, focused effort over the course of a career, and making incremental improvements in extending your network. It’s about making waves that attract other people to you—not about begging others to pay attention’. PLATFORM: All the ways in which you are visible to and communicate with your target audience. AUTHOR BRAND: An author’s perceived image and identity. What reaction do you have when you hear the names Dr Oz, Seth Godin, or James Patterson or Dan Brown? What response do you want when people hear your name up there in author lights? The post also lists elements of Platform – visibility, street cred (credentials), audience – specifically how you are reaching your target audience. In the third and final part of this series I’ll be discussing what this all means (to me) and provide all the reference links used in these posts.I’ll be rounding up what I think is a brand, and how this pertains to my own exploration across genres. Genre Free Jar Label – there’s an annual music festival held in the Temple Bar district, and if you follow your way to the site link, you can download for free the year’s album, featuring several contemporary “genre free” Irish musicians and bands. 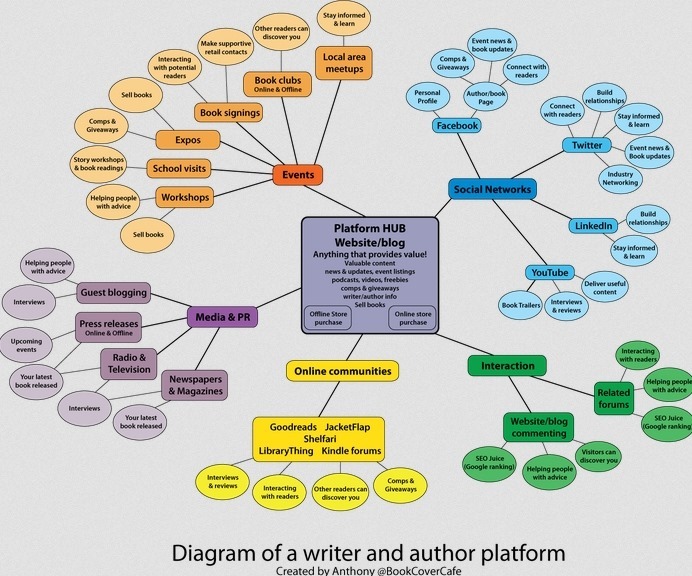 Platform Mindmap – provided in an article on Book Marketing for Author Platform © BookCover Cafe – it’s a good article on marketing, and the mindmap is expandable for reading. I decided long ago that I wouldn’t use any pen names, even though I write in different genres. This means that I have to stick to those elements that make my fiction, well, mine (and that I should probably create some sort of element checklist for myself, haha). I think, as indies, we’re in a better position to determine our own brands. Too many traditionally published authors get locked down as one brand or genre. Remember all the people who freaked out when J.K. Rowling decided to write a non-magic book for adults? I give her major props for branching out of genre, but I’m curious as to what her next move will be, considering her readers’ reactions. I question my decision all the time, especially in light of Rowling’s new book and how her fans received it. I like that, as an indie, I’m free to explore these things as I go. I think that as long as we recognize and stick to those elements that connect our works, we can solidify our brands in a way that makes our readers comfortable. I also think we need to simplify our platforms as much as possible. I’ve been thinking about this a lot lately, and have decided that less is more (for me, at least). Exactly my thinking, Elizabeth. As somebody yet to publish, I think I’m at a good place to develop that brand for myself, as I trug along.